fkalich doesn't have a personal statement currently. I have 9 guitars, that is, 5 Gibsons, 2 Fenders, a Martin, and a Dobro. I also have 9 pets, including 8 cats, Sweetie, Buddy, Sunshine, Daisy Mae, Wooskie Booskie, White Kitty, Tom-Tom, and Scampy , and my best friend, a dog named BoBo. And now another dog, a Blue Muir called Miska. Obviously a well known youtube site, he has over 2 million subscribers. A lot of interesting and intelligently presented videos. The one on AI is frightening. Todd and I were discussing dogs, and as this forum has not had one of these threads in a number of years, at least that I have seen, I thought to post one. Cats, hamsters, snakes, horn toads, fish all are welcome. The Poo-Wawa and Yorkie-Poo are my sister's, they spend a lot of time with me though, she just lives down the street. She never takes her dogs places, so I always pick them up to accompany my dogs on our daily outings. We have a great spacious dog park with trails through the woods and a dog beach on the lake where the dogs can swim. 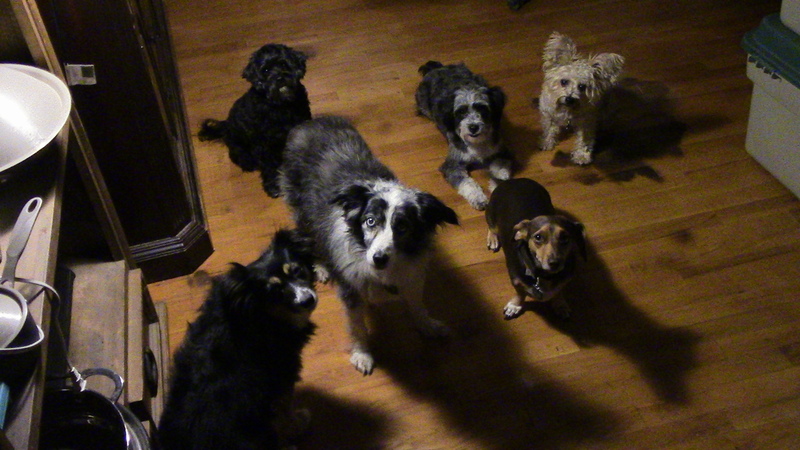 The 2 miniature Australian Shepherds, the miniature Aussie-Poo , and the Chi-Weenie are mine. The Australian Shepherd breed actually did not originate in Australia, the name is a misnomer. They are a mix of several herding dogs brought to California and the American Southwest in the 19th century, and native American dogs. They often have blue eyes, native Americans had a name for them, "ghost dogs". Scientific American graded the candidates on their answers to 20 questions about various aspects of scientific endeavor. The questions were refined by a group of scientific institutions representing more than 10 million scientists and engineers, with nonprofit organization ScienceDebate.org as the facilitator. The results. That Trump is a mindless gerbil is not surprising. And that Johnson, who did not know what Alleppo was, or who could not name even one world leader, well that his is not much better than Trump is also not surprising. But it does not matter to Trump's herd, they will still vote for him. Fortunately as things have gone, with more to come, nobody else will. America and the World dodged a bullet on this one (barring some horrific miracle saving him). Thank god for the liberal press taking on the challenge of saving the country. Sweden! Just thought I would mention it as this is a Swedish website. Now here is the kicker. A list of least religious countries. Curiously enough, they are also at the top of the list of BEST COUNTRIES to live in. I have a little dog as well, funny little mix named Fenris.